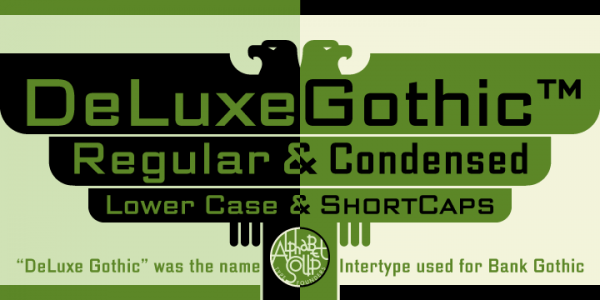 Alphabet Soup Blog » Blog Archive » Introducing DeLuxe Gothic — 50% Off Special! Introducing DeLuxe Gothic — 50% Off Special! Due to a threatened lawsuit by the folks at FontHaus (who somehow believe they are the only ones entitled to use the name “Bank Gothic”) I have changed the name of my font “Bank Gothic AS” to “DeLuxe Gothic“. I have great respect for the original designer of Bank Gothic, Mr. Morris Fuller Benton, and chose the name DeLuxe Gothic because it was the name that The Intertype Corporation used for their version of this classic font during the early years of the 20th Century. My particular take on this design was that I always felt it could use a set of lowercase letters, and that is what sets my font apart from the rest. You can get a better look at it if you download the DeLuxe Gothic Brochure.